This sampling exercise provides raw data for students to test their skills in processing and interpreting sampling results. For more information on the exercise, see the Introduction. The raw data presented below was collected by students in a practical ecological sampling exercise on the Heathland Restoration Project area, at the Woodland Education Centre, Offwell. 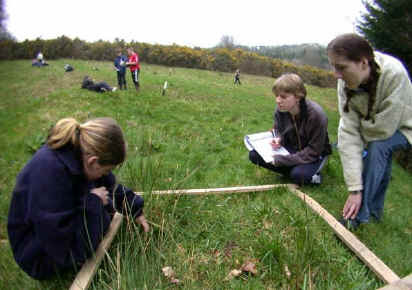 The students were investigating the effect of different types of management on Bluebell survival on the heathland site. The site was formerly woodland and Bluebells are a woodland indicator species. Bluebell % Cover in Random 1m2 Quadrats on the Heathland Restoration Project area at Offwell. for permission to publish the data and follow-up exercise.